Hi, I'm called David Lopez. I'm from Barcelona and I would like to know that it means a tattoo that I did to myself years ago. 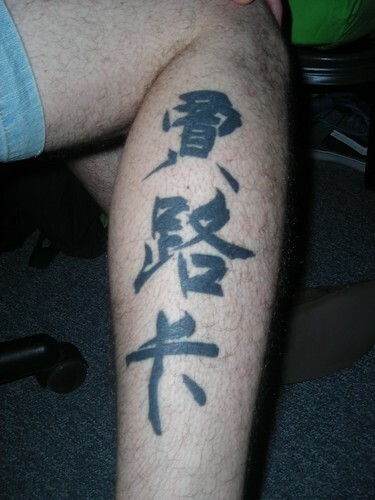 I believe that it is Chinese and though I did it for aesthetics, now I am afraid of taking a meaning that I don't want. My girlfriend and I would have a lot of interest to know the real meaning of my tattoo. Thank you very much in advance. You will be of great help! 賈 means "buy/trade", 路 means "road, path", 卡 means "card". 賈路卡 sounds like a type of prepaid card that allows its owner to access public transportation. Typically it is called 乗車券 定期券 (short for 定期乗車券) in Japan and 月票 in China. Some readers suggested this could be translation of "Jeanluc", but that is not correct. Jeanluc is 吉魯克.